1) Choosing a Floor Plan– In this step a floor plan is chosen that closely matches your needs and reflects your ideals. A floor plan can be chosen from our standard plans, selected from another source, or a custom design. In this stage we either modify the existing plan or draw a new layout. 2) Obtaining an Estimate– Once we have a floor plan, then we gather all the costs necessary for your project. This takes approximately a week. Then we receive a Quotation Sheet detailing the package inclusions and price. 3) Deposit and Signing of Contract – Once you are ready to move ahead with your log home order we require payment of 50% of the total log shell price. This locks in your price, finalizes your drawings with our designer, and secures your log materials. Approximately 2-4 weeks is needed for the homeowner to view the preliminaries, make any desired changes, and receive the modified prelims for approval. 4) Final Payment– The final 50% payment for the log materials is required two weeks prior to scheduled loading date. 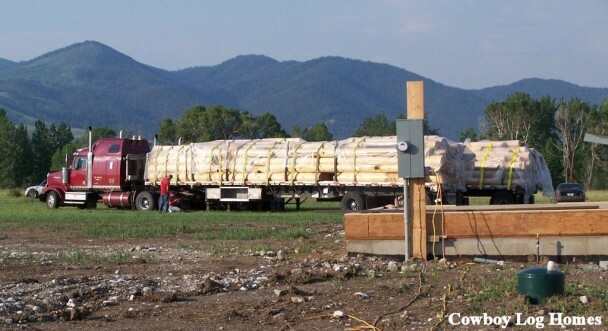 5) Construction of Milled Log Home– Typically 4-9 months is required to complete a full turnkey solution. Key factors that dictate exact construction time include size of home, weather, specifics of job site, and the builders schedule. To Sum It All Up– Please allow approximately 10-12 weeks from initial 50% deposit until delivery of your milled log and material package. 2) Obtaining an Estimate- Submission of plan for quote estimate. Please allow approximately one week. 3) Deposit and Signing of Contract – Once you are ready to move ahead with your log home order we require payment of 40% of the total log shell price. This locks in your price, finalizes your drawings with our designer, and secures your log materials. Approximately 2-4 weeks is needed for the homeowner to view the preliminaries, make any desired changes, and receive the modified prelims for approval. 4) Second Payment– A second payment of 30% of the log shell contract is due when the logs are pre-built in our yard to five (5) rounds up. 5) Final Payment– The final 30% payment for the log materials is required two weeks prior to scheduled loading date. 6) Construction of Handcrafted Home– 4-9 months to complete a full turn key solution. Key factors that dictate exact construction time include size of home, weather, specifics of job site, and the builders schedule. To sum it all up, please allow approximately 12-16 weeks from initial deposit to delivery of your handcrafted log and material package.